AAMAD- Dancing wheels is the most creative and unique initiative in the world of Indian performing arts. Aamad’s Dance on Wheelchairs in India given by differently abled artistes on Wheelchairs & Crutches are mesmerising, empowering and captivating the audience, thus creating awareness about their potential and skills with their ability unlimited. Unbelievably the abilities of these artistes with disabilities are amazing - they are accomplished to portray the most difficult scenes through their spectacular dance performances in inspiring the masses. Surprisingly, Wheelchairs and Crutches are converted into different props according to the dance themes like bows-arrows, swords, chakras, chariot etc. Aamad’s wheelchair dance in India has gained tremendous popularity all over the world due to its unique style of dancing on wheelchairs and crutches. These artists come from highly skilled professional background and are well trained in semi classical and contemporary dance for more than a decade. 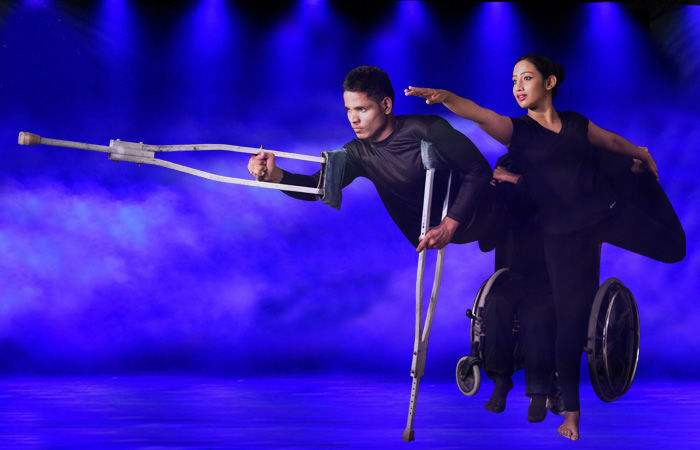 AAMAD's artists unit has travelled widely and featured in prestigious National and International dance festivals with the message of inclusion and accessibility.